The National Park Service turns 100 on August 25, 2016. As part of the celebration, entrance fees are waived at all National Park Service facilities from August 25 through August 28! 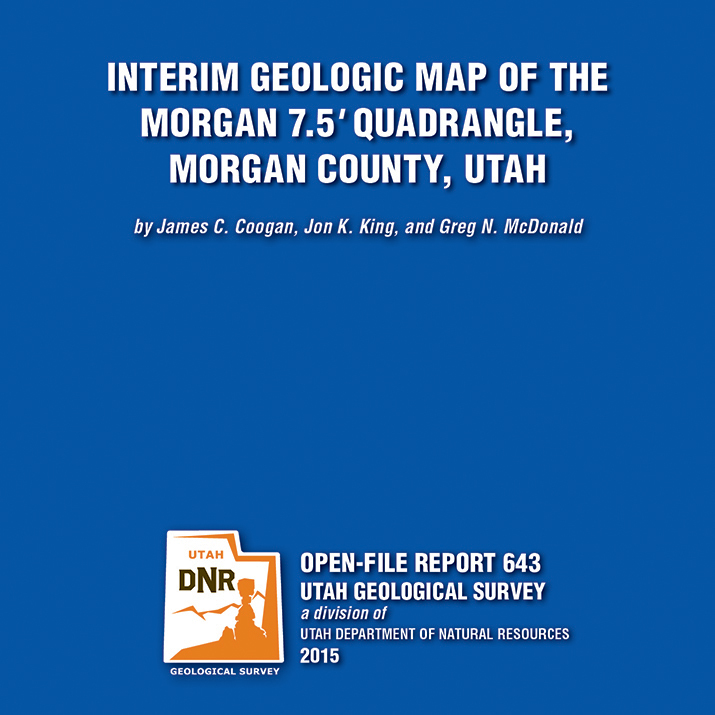 The Morgan 7.5′ quadrangle, named for the city of Morgan, is located southeast of Ogden, Utah, and is transected by Morgan Valley where the Weber River, U.S. Interstate Highway 84, and Union Pacific Railroad are located. 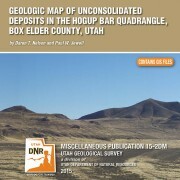 In the map area, the east-dipping limb and part of the Wasatch anticlinorium are exposed on Durst Mountain, east and north of the Weber River. Interpretations of the geology on Durst Mountain begin with back-rotation of this limb of Paleozoic rocks. Younger Paleozoic and Mesozoic rocks in the limb are exposed to the east in the Devils Slide quadrangle. At least 8000 feet (1800m) cf folded Cenozoic sedimentary rocks fill the fault-bounded Morgan Valley. Some fault scarps are Quaternary in age. The most notable fill is the Eocene and Oligeocene(?) Norwood Formation that underlies roughly the west half of the quadrangle. These altered tuffaceous rocks are prone to landsliding. This CD contains two plates-a geologic map at 1:24,000 scale and an explanation plate-and a 25-page booklet, all in PDF format. 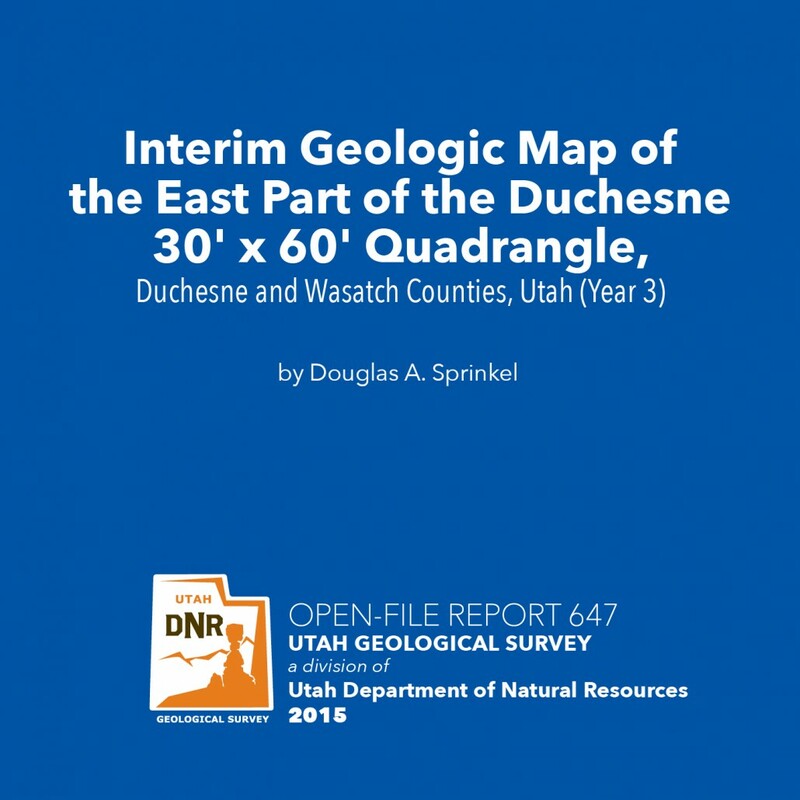 The interim geologic map of the east part of the Duchesne 30’x60′ quadrangle (year 3) consists of eighteen 7.5 minute quadrangles and is the third year of a multi-year project to map and compile the geology of this quadrangle. The quadrangle is located mostly in the western Uinta basin, with the northwest corner located along the southwest flank of the Uinta Mountains but the area mapped is centered on Roosevelt, Utah. The map area includes a variety of surficial deposits that range from historic to lower Pleistocene piedmont alluvium, stream alluvium, and glacial deposits. 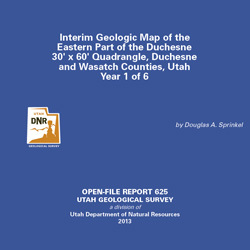 Bedrock map units include members of the Duchesne River formation, the upper two members of the Uinta Formation, and upper two members of the Green River Formation. Members of the Duchesne River Formation are (in descending order) Starr Flat, Lapoint, Dry Gulch Creek, and Brennan Basin. Members of the Uinta Formation are (in descending order) member C and member B. The sandstone and limestone facies and the saline facies are of the Green River Formation are exposed south of U.S. Highway 40 and south-southwest of Duchesne, Utah. 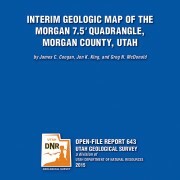 Structural features include the axis of the Uinta Basin syncline (and associated folds), the Uinta Basin-Mountain boundary fault zone located in the northern part of the map area with evidence of movement in the Quaternary, and the Duchesne fault zone located in the southern part of the map area. 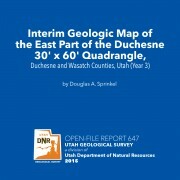 The Duchesne 30’x60′ quadrangle also contains an array of geologic resources including minerals, phosphate, sand and gravel, and gilsonite, but energy resources are the most significant with the giant Altamont-Bluebell and Monument Butte fields included in the quadrangle. 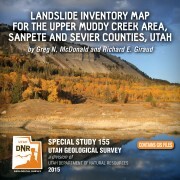 This map represents a landslide inventory for the upper Muddy Creek area, Sanpete and Sevier Counties, Utah, at a scale of 1:24,000. The map covers 54 square miles on southern part of the Wasatch Plateau and includes the Beaver Creek and Horse Creek Hydrologic Units in the east-southeast-draining Muddy Creek headwaters. The map and accompanying geodatabase show and characterize landslides and provide information useful for managing landslide-related issues. 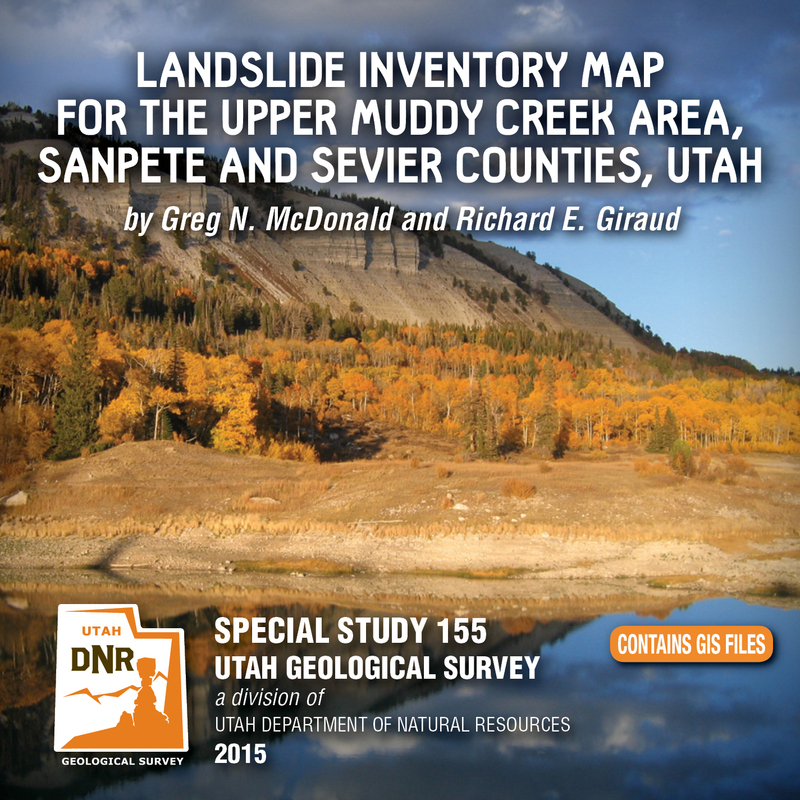 Spatial and tubular data for each landslide are stored in the geodatabase and linked to the inventory map. Landslide information in the geodatabase includes: area, material type, movement type, landslide deposit name, landslide source name, movement activity, thickness, movement direction, approximate movement dates, geologic unit(s) associated with landsliding, confidence in mapped boundaries, mapper, peer reviewer, and general comments. 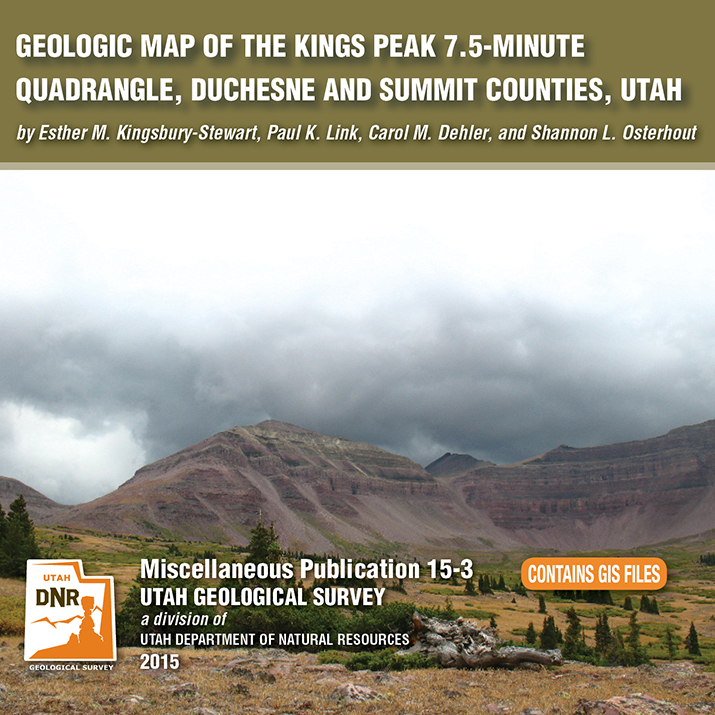 The Kings Peak 7.5-minute quadrangle straddles the crest of the Uinta Mountains in the High Uinta Wilderness Area and contains Kings Peak, Utah’s highest point. The peaks and cliffs are comprised of the newly formalized formations of the Neoproterozoic (late Precambrian) Uinta Mountain Group, which is about 770 to 742 million years old. The basins, basin margins, and cirques are filled with glacial deposits of Smith Fork age-32,000 to 14,000 years ago (Pinedale equivalent). The quadrangle also straddles the anticline crest of the Uinta arch. A series of igneous dikes are exposed in the quadrangle. These dikes cut formations of the Uinta Mountain Group are about 450 to 490 million years old. By: Rebekah E. Wood and Thomas C. Chidsey, Jr. 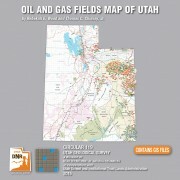 This CD contains an easily viewable 1:700,000-scale map in PDF format of Utah’s oil, gas, and CO₂ fields (past and present); oil gas and CO₂ pipelines with operators; field designations; names and ages of the reservoir rocks; oil refineries and natural gas processing plants; park boundaries and other geographical attributes; and some surficial geologic features. 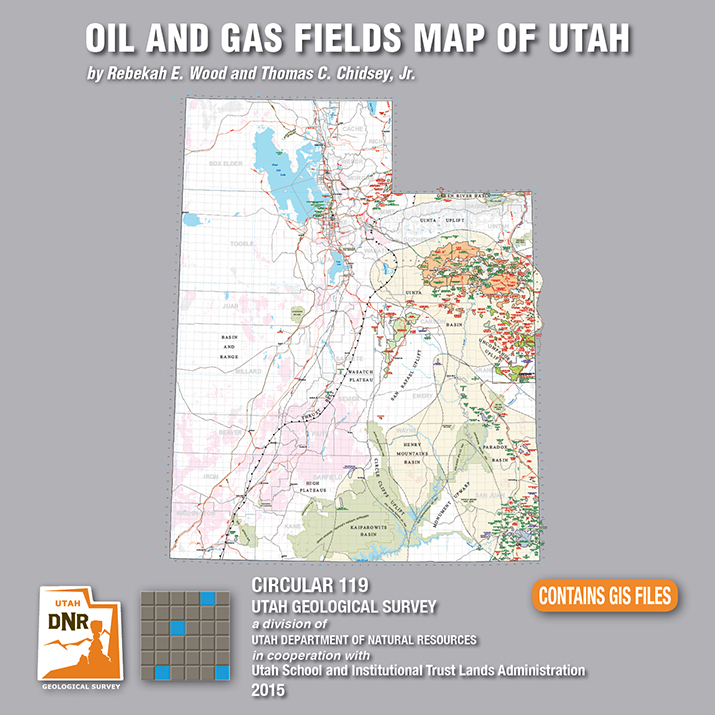 This map is to be used for a general overview and reference for hydrocarbon resources, production, transportation, and processing in Utah. Also included are geographic information system (GIS) files in ESRI file geodatabase and shapefile formats. The latest version of Adobe Reader is required to view the PDF file. 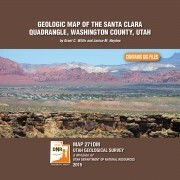 The Santa Clara 7.5′ quadrangle is in the northwestern part of the St. George basin in southwestern Utah, and includes Santa Clara and Ivins Cities, and colorful Red Mountain and Snow Canyon State Park. Movement on an underlying thrust fault created a variety of faults, joints, deformation shear bands, and brecciated rock in Triassic and Jurassic strata in many areas. Remnants of six Quaternary basalt flows cap ridges and benches, forming classic inverted valleys, and form lava cascades in Snow Canyon State Park. The young Santa Clara flow cascaded through Snow Canyon and flooded across broad benches, forming scenic black terrain that contrasts sharply with red-brown to near-white sandstone cliffs. Landslides, rock falls, swelling clays, and other geology and related flooding and debris flow hazards have caused extensive damage in recent years and present increasing challenges as growth and development continue. “Blue Clay” of the Chinle Formation has been at the root of significant damage to roads, buildings, and infrastructure. 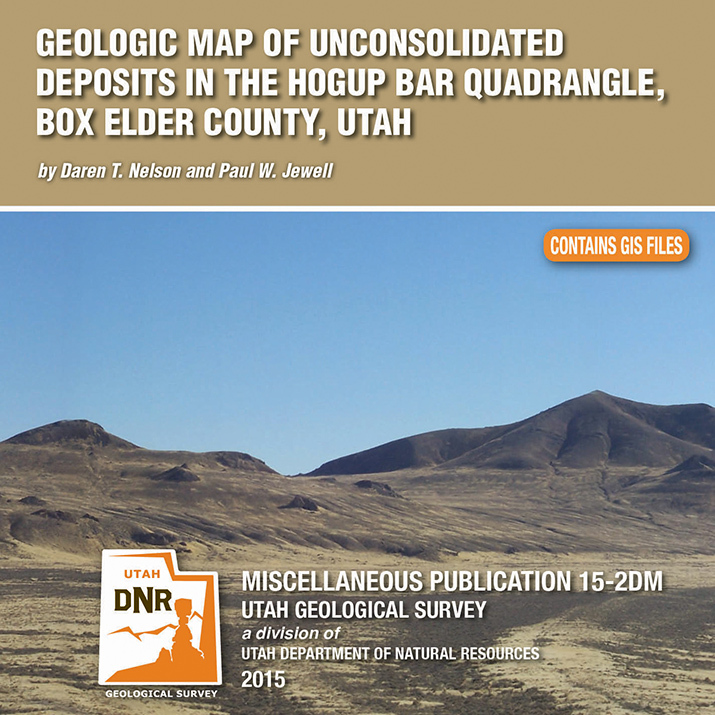 The Hogup Bar quadrangle is located southeast of Park Valley, Utah, and west of the northwest arm of Great Salt Lake. Late Pleistocene Lake Bonneville sediments and related shorelines dominate the landscape, and record the transgression and regression of Lake Bonneville. Surficial deposits overlie Tertiary basalt and Permian-Pennsylvanian sedimentary bedrock. 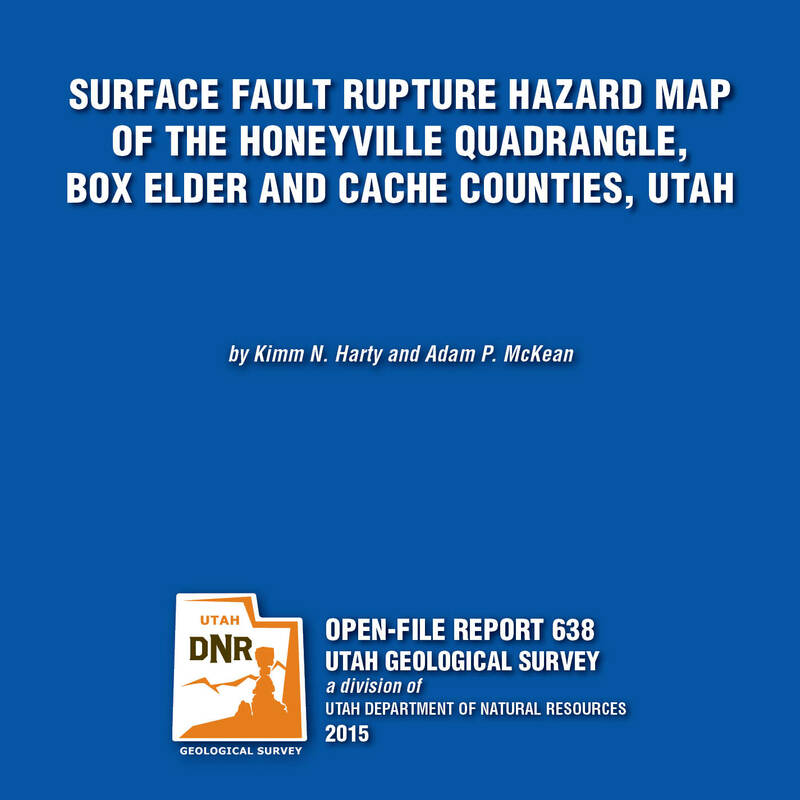 This 1:24,000-scale surface fault rupture map of the Honeyville quadrangle shows potentially active faults and special-study areas for the Brigham City and Collinston segments of the Wasatch fault zone mapped using primarily 0.5-meter digital LiDAR data acquired in 2013 and 2014. 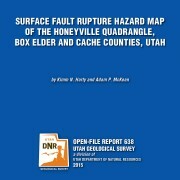 Fault traces were also mapped using black and white stereographic and oblique aerial photographs and previous published sources for the Wasatch fault zone and parts of the West Cache fault zone contained on the Honeyville quadrangle. 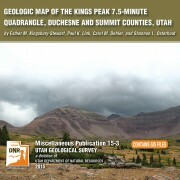 This CD contains the geologic map at 1:50,000 scale and a 19-page booklet, both in PDF format. The map covers six 7.5-minute quadrangles in the eastern part of the Duchesne 30’x 60′ quadrangle. The quadrangle is located mostly in the western Uinta Basin, with the northwest corner located along the southwest flank of the Uinta Mountains but the area mapped is centered on Roosevelt, Utah. The map area includes surficial deposits that range from historic to lower Pleiestocene piedmont alluvium, stream alluvium, and glacial deposits. 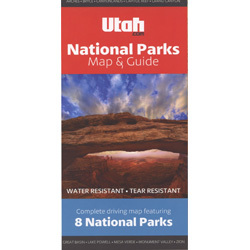 Bedrock map units include the Duchesne River and Uinta Formations. 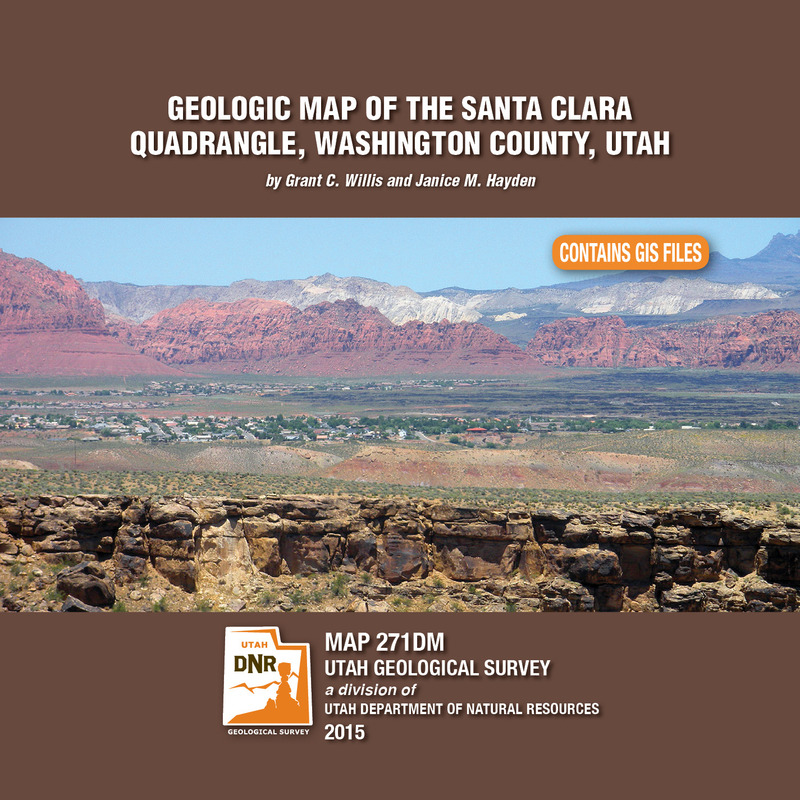 Structural features include the axis of the Uinta Basin syncline (and associated folds), the basin boundary fault zone in the northern part of the map area, and the Duchesne fault zone in the southern part of the map area. The Duchesne 30’x 60′ quadrangle also contains an array of geologic resources including minerals, phosphate, sand and gravel, and gilsonite, but energy resources are the most significant with the giant Altamont-Bluebell and Monument Butte fields located in the quadrangle.